Come back ‘home’ to the School for the main OB event of the summer! This is the perfect opportunity to get your old classmates together for a long overdue get-together or show your partner where you went to School. Join us for a tour to see how much the School has changed (or what has stayed the same!) and enjoy a lunch with over two hundred other Old Bedfordians and guests. You are welcome to join us for any or all of the parts of the day listed below, but particularly hope you will join us for the At Home Lunch which has been going from strength to strength in recent years. We are inviting all Old Bedfordians, Former Staff and Honorary Life Members and their guests to start the day with a coffee in the Memorial Hall. At 11am we will commence the Tour of the School, whilst the boys are starting Prize Giving in the Great Hall. Under the current Head Master, James Hodgson, the School is keen to make more of an occasion of the last day of term for the boys and to celebrate their achievements, particularly the leavers and as a result the School Prize Giving is moving from earlier in the summer term. The Tour will visit various buildings around the School. Those who wish to attend the OB Club AGM will finish their Tour early and be shown to the Memorial Hall at 12pm - all others will continue on the Tour and finish at the marquee for the At Home Drinks Reception. The AGM in the Memorial Hall is open to all who would like to attend, where the Director of the OB Club will give a report on the activities of the Club over the last year. The AGM will conclude by 12.30pm. 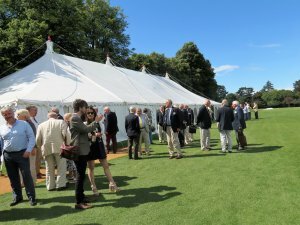 All OBs, Former Staff and Honorary Life Members and their guests are invited to the Drinks Reception held in the marquee next to the Langham Cricket Pavilion, along with those who started the day earlier with a Tour. Or feel free to join current parents, staff and boys in one of the house gazebos for a drink on the north side of the School building. The At Home Lunch is a fantastic occasion with OBs of all ages enjoying a delicious three course meal in the marquee on the School playing fields. The 1st XI also take on the Head Master's Invitation XI in a new take on the traditional cricket fixture during this time. Stay on after the lunch to end the day with an afternoon tea in the marquee. The main event is the At Home Drinks Reception and Lunch, which costs £16 for Subscribing Members and £23 for OB Club Members and Guests (including a £1 online booking fee per person). The other parts of the day are free of charge. OB Club Members can become a Subscribing Member today to take advantage of the generous discount. Subscription costs just £25 per year, and includes other benefits including a substantial discount for the Annual Dinner in November, a hard copy of the annual Ousel publication (the primary OB and School communication) in December, and unlimited access to the School Heritage website which holds a searchable database of Ousels back to 1876. Dress Code: Smart Casual. No shorts, please!